The US unemployment rate dropped down to 3.9% in April, from 4.1% in each of the previous six months. It hasn’t been this low since December 2000. The April decline was driven by non-white workers, according to the Bureau of Labor Statistics’ latest jobs report. 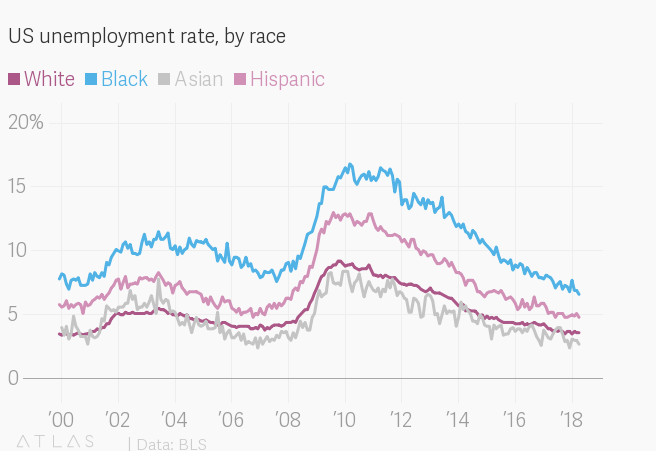 In April, the unemployment rate for black Americans fell to 6.6% from 6.9% in March. The unemployment rate for Asian Americans also dipped, to 2.8% from 3.1% The jobless rate for Hispanics fell to 4.1% from 4.4%. Meanwhile, the white unemployment rate remained unchanged, at 3.6%. Month-to-month unemployment numbers can be volatile, and mask other trends. While the black unemployment rate fell pretty steeply in April, the number of black workers employed that month fell, too. So, the decline in the black unemployment rate was driven less by new workers getting jobs, and more by workers leaving the workforce (which removes them from the calculations entirely). 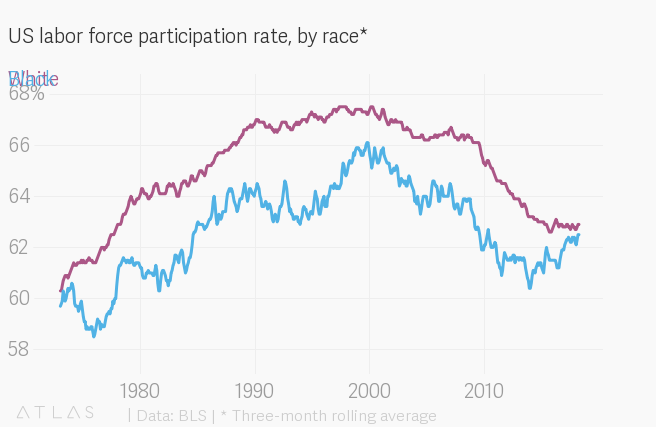 That said, a persistent gap in black-white labor force participation appears to be closing (paywall). That’s a signal that more black workers are steadily being drawn into the workforce, as white workers’ participation has fallen and, more recently, stagnated.